Long to see your special person once more? 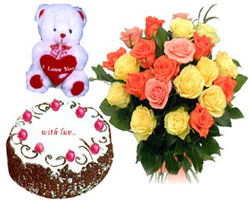 Let him know it by sending him these 24 pieces of rose with gorgeous glass vase,chocolate cake and 9 inches teddy bear with i love you pilow! Your gift will come with a greeting card and your message.